Aphex is proudly American... 100% owned, engineered and manufactured in the U.S.A. Aphex is a registered trademark of Aphex Systems Ltd.
AC Input: IEC standard receptacle with voltage selector, fuse and filter. Unit mounts in standard 19” rack, using 1 RU of vertical space. and sonic variability found in traditional tube designs. compression curve makes the transition into compression virtually invisible. with more apparent power. Higher frequencies also seem to gain more detail and presence. • Auto or full Manual operation. In Auto mode, compression parameters constantly change for best sound. • A true tube circuit (Tubessence) in the output stage for a “warm”, “live” and “full” sound. 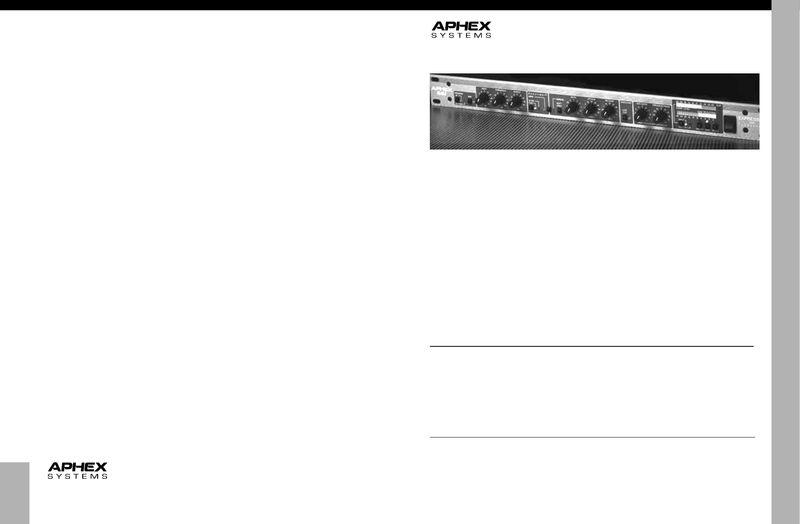 • HFX allows the use of high compression ratios without the loss of high frequencies. • SPR increases apparent bass energy level, without amplitude equalization or bass boost. • Use Sidechain Access jacks for creative processing (de-essing and ducking). • Stereo, dual mono or master/slave operation for total flexiblity. Music Production - Improve the sound on individual instruments, vocals and mixes. Sound Reinforcement - A roadable tube compressor/limiter in only one rack space. Broadcast & Post Production - A great vocal processor and a powerful studio tool. Project Studios - Improve the sound of digital recorders and workstations. Musicians - The ultimate compressor for the professional guitar, bass, keyboard instrument rig.